This 3B Scientific® stomach pathology model demonstrates various stages of gastritis from a light gastric ulcer to a perforation. 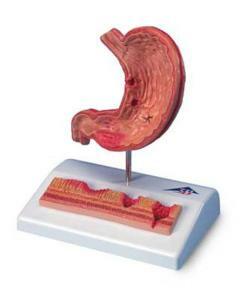 The stomach section with esophagus and duodenum attachment in half life size shows the following pathological changes of the stomach: Erythematous gastritis, Erosive gastritis, Hemorrhagic gastritis, Healing stage with scar formation, Atrophic gastritis, Hypertrophic gastritis, Bleeding ulcer and Perforated ulcer. Delivered on base.